"Food," says Paul, "is a fundamental human right." He has been a champion of social justice through leadership and his personal commitment to helping to create a more just and sustainable food system and world. Paul M. Taylor was hired as the Executive Director of FoodShare Toronto in April 2017. Paul is the previous Executive Director of Gordon Neighbourhood House, a community organization based in the West End of Vancouver. 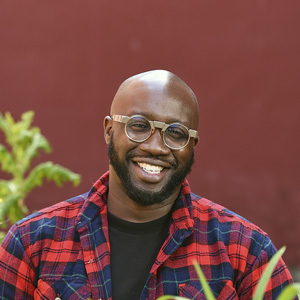 Under his leadership, Gordon Neighbourhood House emerged as an innovator in operating community-based food initiatives, while also working to challenge the systems that maintain poverty. Paul uses humour, creativity and a sincere curiosity to inspire and connect with everyone that he meets. Welfare reform and social programs are close to Paul; growing up in Toronto on Welfare as a child has shaped his vision on the right to food and set forth an activist path grounded in social justice and food security. Paul has been a guiding force in the food security conversation for several years, his impact reaches far beyond regional or Provincial boundaries. His leadership journey began as a teacher in downtown Toronto and then as a Business Administration Instructor at a local college. Paul’s previous work experience also includes serving as Executive Director for the Downtown Eastside Neighbourhood House and prior to that at Second Base Youth Shelter. He has served on the board of the Metro Vancouver Alliance and is the founder of the Vancouver Food Summit. While living in Vancouver, Paul was also the Co-Chair of BC’s Poverty Reduction Coalition, a coalition of over 400 groups advocating for a comprehensive BC Poverty Reduction Strategy. He served on the Board of Directors of the Canadian Centre for Policy Alternatives (BC office). He is currently the Vice-Chair of Food Secure Canada.